It can be hard to know how to console a friend or relative who is grieving. If it seems that nothing you can do or say helps, don't give up. You can't take the pain away, but your presence is more important than it seems. Accept that you can't fix the situation or make your friend or relative feel better. Instead just be present and offer hope and a positive outlook toward the future. Recognize that grief is a gradual process. 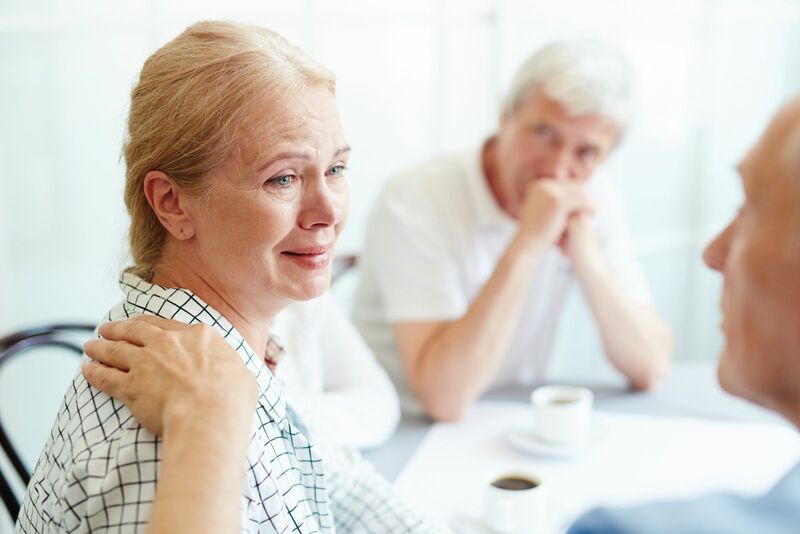 Even small gestures—sending a card or flowers, delivering a meal, helping out with laundry or shopping, or making a regular date to listen and offer support—can be a huge source of comfort to a person who is grieving. One woman, a dog lover who had recently lost her husband, recalled her joy when a close friend went to the pound and brought her a basket of puppies that needed to be fostered for a few weeks. It's important to be flexible and open to a person's way of grieving. For example, if a bereaved friend or family member is coming to your house for the holidays, ask if you can do anything to help mark the loss during this occasion. Be willing to leave plans loose. Build in a loophole when you extend the invitation: "We would love to have you join us. You needn't decide until the last minute, if you want some time to think about it." Gently press a person to accept your invitation, but take "no" for an answer without ire. Call the next day to check in. It is sometimes difficult to know what to say to a bereaved person. If you find yourself tongue-tied or uncertain of what to do in the face of someone's loss, here are some ideas to help you. Name names. Don't be afraid to mention the deceased. It won't make your friend any sadder, although it may prompt tears. It's terrible to feel that someone you love must forever be expunged from memory and conversation. Saying how much you'll miss the person is much better than the perfunctory, "I'm sorry for your loss." Don't ask, "How are you?" The answer is obvious—"not good"—and because it's the same greeting you would offer anyone, it doesn't acknowledge that your friend has suffered a devastating loss. Instead try, "How are you feeling today?" Offer hope. People who have gone through grieving often remember that it is the person who offered reassuring hope, the certainty that things will get better, who helped them make the gradual passage from pain to a renewed sense of life. Be careful, though, about being too glib, as doing so may make the bereaved person feel even more isolated. Rather, say something like: "You will grieve for as long as you need to, but you are a strong person, and will find your way through this." This remark both acknowledges that there is no quick and easy solution and also affirms your confidence that things will improve. Reach out. Call to express your sympathy. Try to steer clear of such phrases as "It's God's will" or "It's for the best" unless the bereaved person says this first. Your friend or relative may need you even more after the first few weeks and months, when other people may stop calling. Check in every now and then just to say hello (you may find it helpful to put reminders on your calendar). Most bereaved people find it difficult to reach out and need others to take the initiative. Help out. Don't just ask if you can "do anything." That transfers the burden to the bereaved, and he or she may be reluctant to make a request. Instead, be specific when offering help. Bring dinner over, pass on information about funeral arrangements, or answer the phone. Pitch in to clean up the kitchen. Sometimes your help is most valuable later. A lawyer might help answer questions about the estate. A handy person might button up the house as winter approaches. Listen well instead of advising. A sympathetic ear is a wonderful thing. A friend who listens even when the same story is told with little variation is even better. Often, people work through grief and trauma by telling their story over and over. Unless you are asked for your advice, don't be quick to offer it. Frequently, those who are grieving really wish others would just listen. It's your understanding—not your advice—that is most sorely needed. Avoid judgments. Your friend's life and emotional landscape have changed enormously, possibly forever. You may wish he or she would move on, but you can't speed the process or even ensure that it happens. Let your friend heal at the pace that feels right and in his or her own manner. "You should cry" or "It's time to move on" aren't really helpful directions. To learn more about ways to live with your own loss and grief or assist others in the same situation, purchase Grief and Loss: A guide to preparing for and mourning the death of a loved one from Harvard Medical School.